Total Protein is a ground-breaking supplement designed to provide an unparalleled supply of protein throughout the day. Total Protein provides a unique protein blend of slow (Milk Concentrate), moderate (Egg White) and rapidly absorbed (Whey Isolate) proteins. Total Protein also contains 4g of Glutamine Peptides and 1.5g of Flaxseed per serving. Total Protein provides over a 46g of protein per serving which will contribute to the growth and maintenance of lean mass. Who is Total Protein Suitable for? 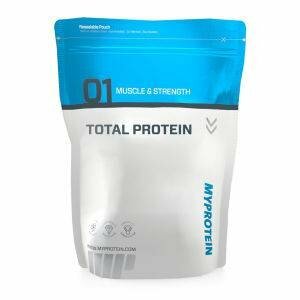 Total Protein is ideal for anyone looking to increase daily protein intake in the form of whey, milk and egg protein. Total Protein is also a great way to get a source of flaxseed which provides essential fatty acids (EFA's). Total Protein is recommended to be consumed in the evening or around training.